Our lab will consist of three virtual machines as shown in Figure A. Please remember that you must have these three virtual machines networked and connected to the virtual domain. Instructions on how to network your virtual machines and connect them to the virtual domain controller are outside the scope of this article. In order to install the MOM user interfaces, select the MOM 2005 setup icon. This will launch the install wizard. 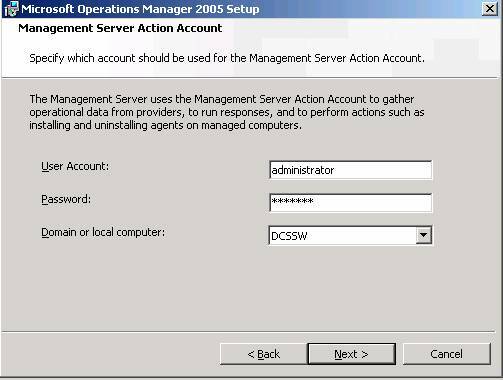 Next, click Install Microsoft Operations Manager 2005 (Figure B). Accept the License Agreement and choose a Custom installation. On the Custom installation window, make sure you only select MOM 2005 User Interfaces (Figure C). Once the installation is finished, click the Finish button and deselect the checkbox to Start the MOM Administrator Console (Figure D). Note: In order to make sure you meet the minimum requirements for you virtual lab, make sure to use the Check Prerequisites utility located on the cd-rom. Note: In order to make sure you meet the minimum requirements for your virtual lab, make sure to use the Check Prerequisites utility located on the cd-rom. 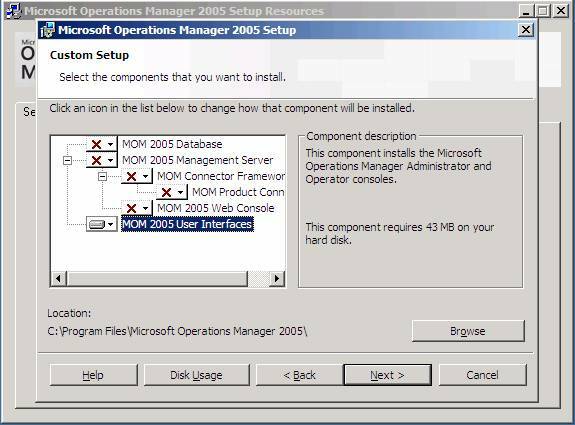 Now that you have the minimum requirements, select the MOM 2005 setup icon. This will launch the install wizard. 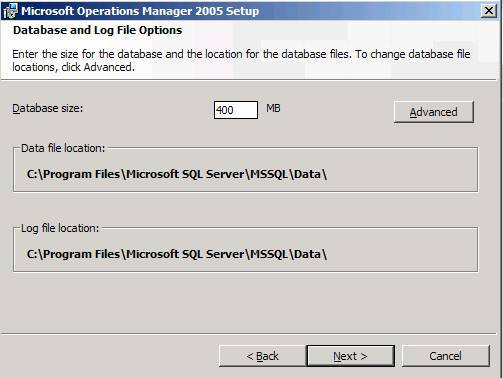 Next, click Install Microsoft Operations Manager 2005 (Figure B). Walk through the wizard and choose a Custom Installation. 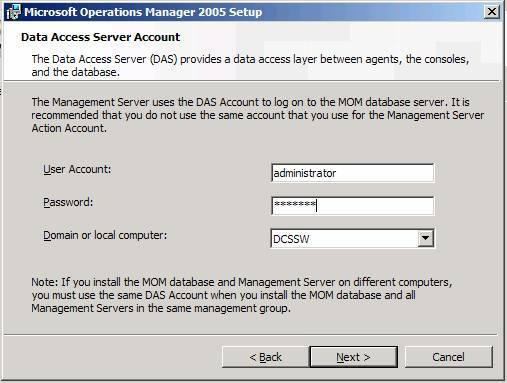 On the Database server, only select MOM 2005 database. Deselect all other components (Figure E). The installation will now make sure you pass all of your prerequisites and prompt you to choose your SQL Server database instance. On the Database and Log File Option window, you can choose your database size. For purposes of this article, we are going to keep the database size small and choose 400 MB (Figure G). 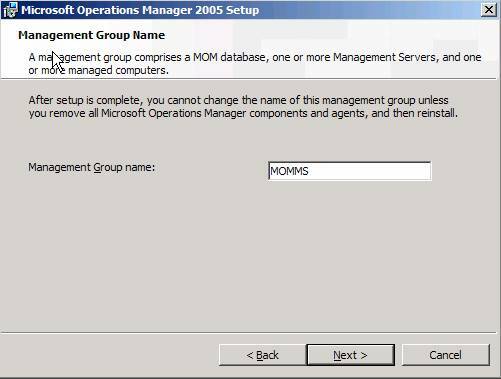 On the Management Group Name window, provide a name for your MOM components, and agents as shown in Figure H. Now you are ready to provide a data access server account as shown in Figure I. You can now work through the remaining defaults and begin the installation. 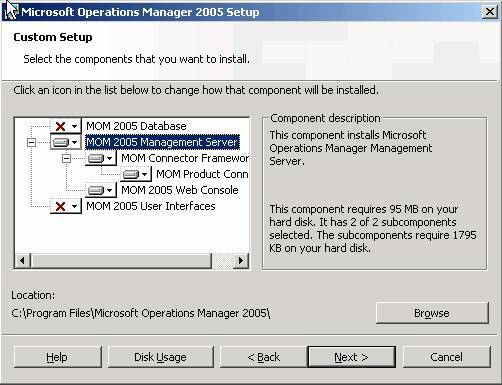 Your first step is to select the MOM 2005 setup icon. This will launch the install wizard. 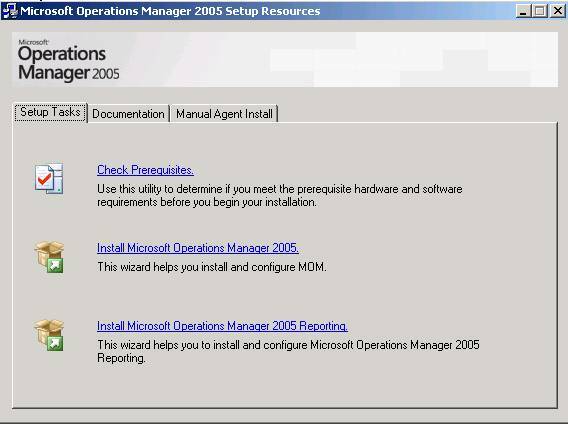 Next, click Install Microsoft Operations Manager 2005 (Figure B). Walk through the wizard and choose a Custom Installation. 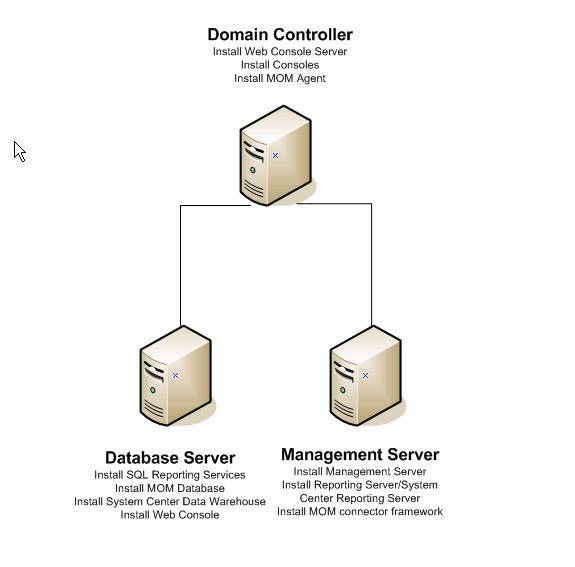 On the Database server, only select the Management Server components. Deselect all other components (Figure J). Next, enter the name of the MOM Database server and continue (Figure K). Finally, supply your account credentials and the appropriate licensing and click the Install button as shown in Figure L.
We are now ready to install the MOM agents. 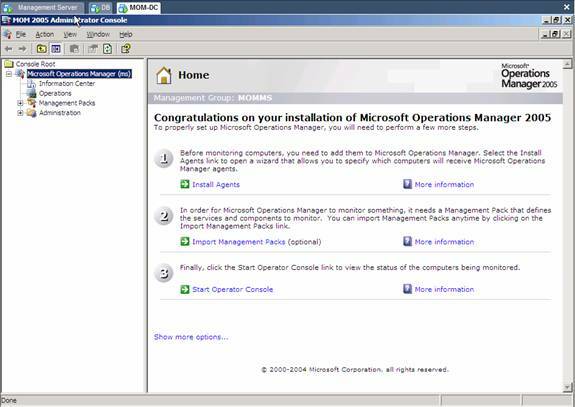 To install the agents, click Start | All Programs | Microsoft Operations Manager 2005 | Administrator console (Figure M). You will be required to enter the name of the Management server. 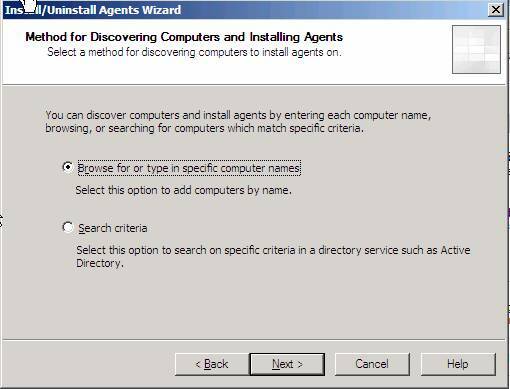 Next, Click Install Agents and choose the Method for Discovering Computers and Installing Agents. We will choose Browse for or type in specific computer names (Figure N). Now you will specify the accounts used to install the agents and accept remaining defaults to install the Agents. 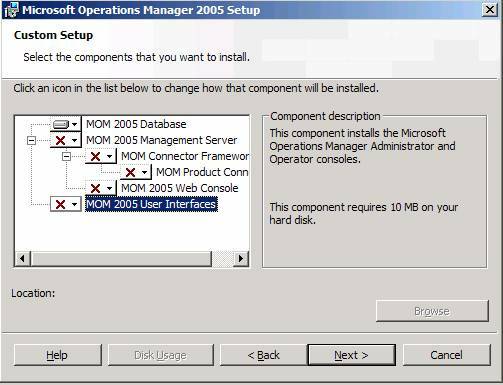 In order to install the System Center Reporting, select the MOM 2005 setup icon. This will launch the install wizard. 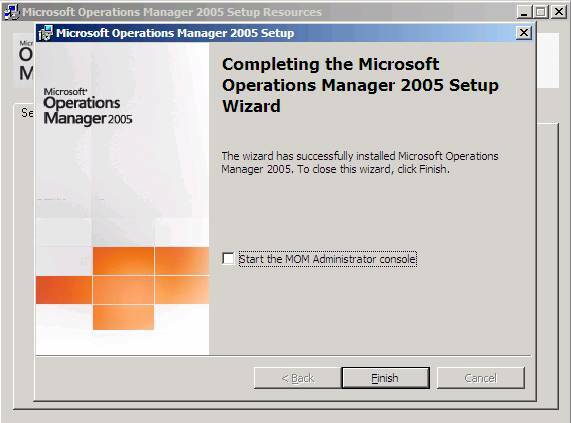 Next, click Install Microsoft Operations Manager 2005 Reporting. You can simply accept the default when working through the wizard and allow the virtual directories to be automatically detected (Figure O). 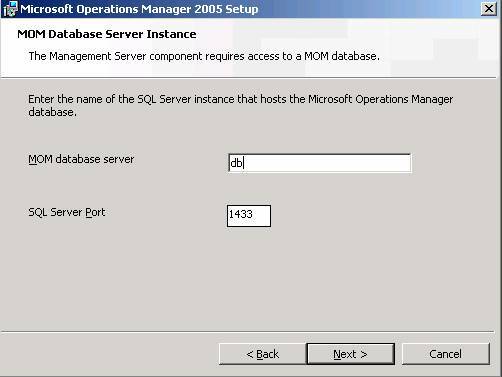 Other options you need to enter are the MOM database server name, database size, and account credentials. 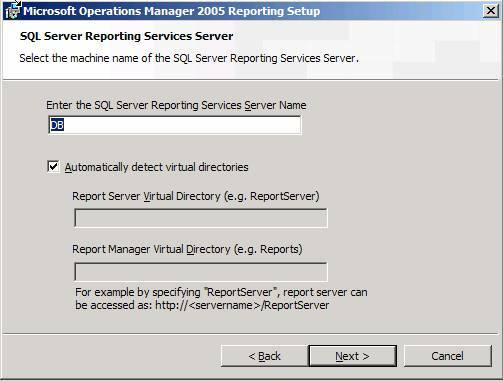 Next week, we will import the SQL Server 2000 Management Pack and Reports and help you become familiar with monitoring SQL Server via MOM 2005.